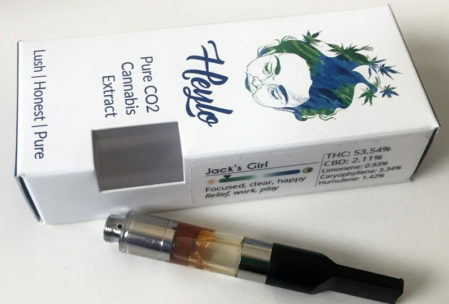 Heylo Cannabis, formally branded as Mother Earth Cannabis Extracts, is a Washington-based cannabis extractor that produces tasty, high quality, terpene-rich cannabis oils. 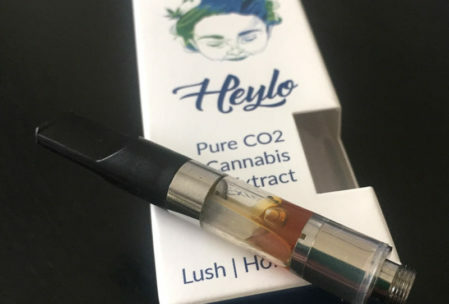 Backed by an environmental chemist as their founder and chief extractor, Heylo Cannabis produces truly top-notch oils for vaping. Not only does Heylo produce great vape oils, but we appreciate their efforts to be a transparent company. Heylo ensures that their consumers are well aware of what goes into their oils. Unlike most vape companies we’ve encountered, at least in the Cali market, Heylo discloses the actual farms where their cannabis is sourced. They also provide a full breakdown of lab facts which includes both cannabinoid and terpene content – so you know exactly what you’re getting. Most companies typically show only cannabinoid content (how much THC is in the product for example). This information is available both on their packaging and on the Heylo website. This is the first time that we’ve had the pleasure to try cannabis oil extracts from an out-of-state producer. We’re extremely pleased to see such quality in production. If other out-of-state brands are producing cannabis vape products half as good as Heylo, we’re confident that the market is booming with quality vapes well beyond California. Heylo cannabis oils are available in pre-filled, 510 threaded vape cartridges which are compatible with most vape batteries. The cartridges use hardware that we have not yet seen in California. The cartridges are fitted with a plastic mouthpiece that screws down into place. All the plastic tipped cartridges we’ve seen pop into place and cover a rubber plunger that prevents oil from leaking out. The tank also seems unusual in that it appears wrapped in a plastic sheath that runs down to the end of the atomizer. The tank also lacks both a visible wick and central pole. This design feels like it restricts airflow, but actually, allows for a decent amount of vapor to pull through. In Cali, it’s common to see plastic-tipped cartridges, but these will usually have a visible wick sticking out of the atomizer. 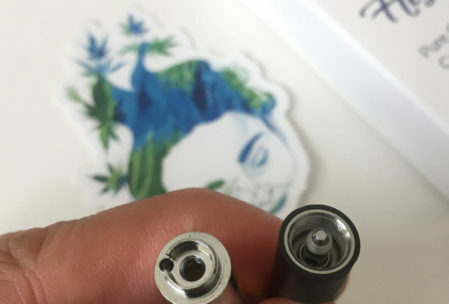 We are noticing that more brands are switching their cartridges over to a metal-tipped design that have a central pole running through the middle of the tank. According to Heylo, they now have a second type of cartridge that also uses ceramic wicks. This other design is used for their Raw line of vapes and uses a top airflow and stainless steel design. They also boast a failure rate on all cartridges of less than 1% which is pretty good. Their branded packaging looks like a natural, organic product that you might find on the shelves of a local WholeFoods market. The side of the package clearly displays the cannabis strain of the extract along with the lab facts including both cannabinoid and terpene content, and the associated high effect along a visual spectrum. Display of all these items is rare among the California-based vape market, but some companies are starting to catch on. Level Blends uses a similar spectrum on their packaging. Mother Earth (now branded as Heylo Cannabis) was founded in November 2016 by Laurel Friesen, an environmental chemist. Laurel previously worked in medicine (gastroenterology) and later as the head of the research and development team at Eden Labs. As chief extractor, Laurel applies her knowledge of chemistry and processing systems to make a terpene-rich, tasty oil. Heylo has refined their process through months of experimentation testing various pressure, temperature, length of extraction and post-processing techniques. Heylo Cannabis is working to serve the emerging market of highly-active and increasingly aware cannabis users. Using CO2 extraction, Heylo creates pure, uncut oil from outdoor-grown cannabis that is rich in terpenes and retains as much of the whole plant goodness as possible. They provide as much information as possible on their packaging and post all 3rd-party lab results online for public consumption. In the near future, they will be launching a line of topicals, including an infused massage oil, as well as extracts for dabbing. Heylo is also doing good for the environment by seeking out clean-green certified flowers from growers like Puffin Farms. Heylo is fully transparent about the cannabis extracts they produce. 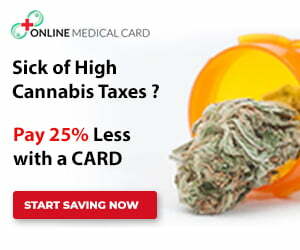 They offer full lab reports including cannabinoids, terpenes, and even the farm where the original flower was sourced. Most companies do not provide full terpene profiles and especially the originating source of flower (at least in Cali). We expect to see this become a trend as consumers become more cannabis-conscious and as more research reveals the importance of terpenes. Many of the Heylo cannabis oils test in the 50-70% THC range. The high CBD cannabis oils can contain as much as 40-50% CBD and can vary from very low to moderately high THC levels. Terpene profiles can also vary between strains. View the full list of available Heylo strains. Heylo Cannabis uses a CO2 extraction process that leaves behind a thick, clear oil with a beautiful amber finish. Other raw, terpene-rich oils we’ve tried, like Sublime Concentrates, are similar in consistency but are very dark in color which is not as appealing if you judge oils by appearance (clearer oil tends to be more refined and pure, but arguably, loses some beneficial cannabis components). 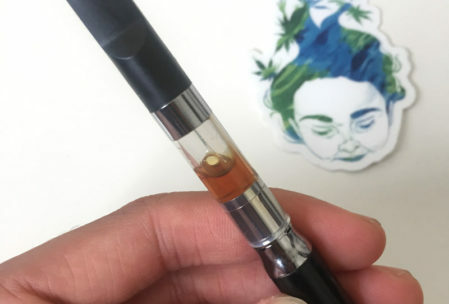 We tried the Jack’ Girl cannabis oil vape cartridge. Overall, the flavor of this oil is very clean, crisp and natural tasting. It closely resembles the true taste of real cannabis flower. When vaped at low temps, Heylo cannabis oils produce a very light, clean vapor that’s extremely easy on the throat and lungs. If you’re into dense, fluffy clouds and strong infused flavors, Heylo Cannabis may not be up your alley. 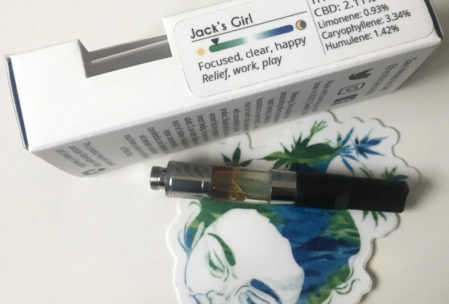 The high effect from the Jack’s Girl vape cartridge left us with a pleasantly subtle, clear-headed buzz – perfect for sinking deeper into a creative mood to write some reviews! 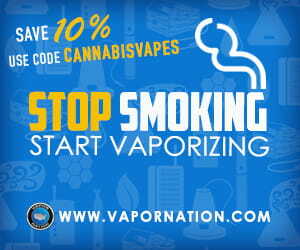 We found that Heylo vape cartridges are best used at low voltage (lower temperatures). We used a Magic Pipe variable bolt battery and found that the flavor is best experienced at around 3.3 volts or less. We’ve gone as high as 3.8v but started to notice that the flavor begins to taste burnt. Take slow shallow puffs and give the cartridge atomizer some time to cool off in between consecutive puffs. The airflow on the cartridge we tried feels somewhat restrictive, but still, it produces an effective amount of vapor. Heylo vape cartridges are available for around $30 for a half gram (500 mg) cartridge in several dispensaries throughout Washington state (currently not available in other states). Find stores that carry Heylo. Heylo offers a line of raw oil vape cartridges that are rich in natural plant terpenes and contain high CBD in varying THC to CBD ratios. They offer a THC/CBD topical as well. Keep updated on Heylo by following @heylocannabis on Instagram and Twitter. UPDATE: Shortly after this review was published, we got the chance to try one of Heylo’s raw oil vape cartridges. The raw cartridges use sturdy, all-metal hardware with excellent airflow. The raw oil is thicker, darker and rich with natural cannabis terpene flavors (it actually tastes like cannabis). 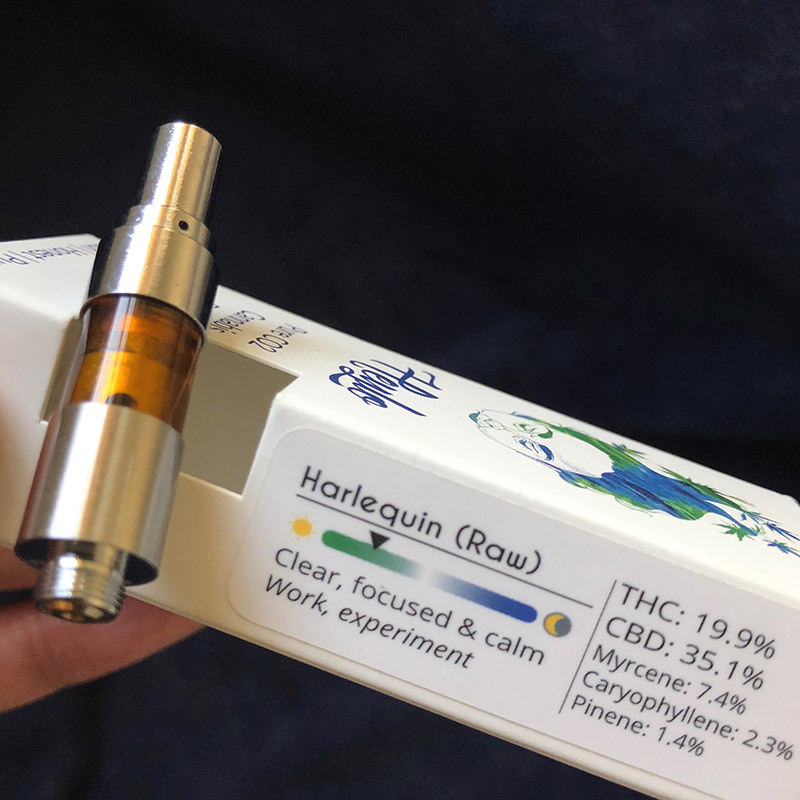 We tried their Harlequin (raw) which is a high CBD strain that induces a clear, focused and calming high effect that’s perfect for doing creative work.